Someone never told the folks who participated in the 2013 Educational Technology and Media MOOC that it was over. They are still at it. They’ve held anniversary celebrations, reconvened to discuss ETMOOC for Connected Courses, and are running online hangouts two years later. There’s a hashtag community in Google+ (wow, I did not even now you could do that), a postetmooc twitter account. Ironically, that photo is the one I tweeted Susan Spellman Cann when I got the tweet while out on the bike. Now it’s now secret I see the ed tech world through the tint of my ds106 glasses. People will sometimes rally a cheer when #cck08 is mentioned, rhizo14 and rhizo15 have strong pulses, but ETMOOC often seems lost in the mix. It remains to me a compelling model that Alec Couros put into motion- engaging others to lead the sessions (so Alec was not center stage faculty), the power of a group shared activity as a first activity (the lip dub project), the pacing of the sessions to be two weeks long. The site remains unshuttered and the blog hub continues to aggregate posts (4746 posts from 513 blogs). The twitter archive was stopped because twitter’s dropping of RSS (it can be done again though), but still when that happened, the site had aggregated 19,000 tweets. I will cherish and take this kind of experience any day over some massive MOOC of tens of thousands of enrollees, 2% or so who stick around, and who’s corpus remains stockpiled behind a login. How long do communities from xMOOCs persist? When Connected Courses was reaching its scheduled end, I jumped a bit over on the organizers who started using the “when the course is over” or “after the course” language. If you use terminal language the participants agree that the experience is terminal. Of course people’s attentions and energy will go elsewhere, but ETMOOC shows that it can have a spreading effect, and bringing in new people too. If you are interested in massive numbers, in growth by scaling, you are talking about a process of duplication, of machination, of factory production. You are talking chicken McNuggets and cookie cutter houses. You are talking cheap plastic trinkets versus hand crafted art. I find little inspiring about growth for the sake of growth. Okay, so maybe 100 people were active in ETMOOC? Maybe 15 are still at it now? 20? 25? The absolute numbers are order of magnitude, but I find more significant than 38,000 signups. But what those non-massive numbers are deeply passionate and the spread their ideas laterally, not by just copy/mass reproduction. I’ll keep saying it- scales are for lizards and doctors offices; in terms of ideas I am way more interested in spreading over scaling. I’m thinking of spinning a clone of this for the community down here around me (México, Latin America). Perhaps a version in Spanish or at least recruiting Spanish speakers but (as always in the cMOOC spirit) letting people use whatever language they want. Besides my people at the Tecnológico de Monterrey perhaps we can find other folks interested down here. Not surprisingly, I couldn’t agree with you more. It was pretty clear, as we were reaching the end of the formal set of wonderfully informal modules in #etmooc, that this was a learning experience and community of learning unlike anything most of us had previously encountered. We came; we saw; we learned; we made; we share the (learning) wealth by incorporating lessons learned into our own training-teaching-learning efforts spannining continents. I’ve always felt that a tweet posted by Thomas Okon (@thomasjokon: https://twitter.com/thomasjokon/status/317439416836702208) pretty much was our course/community anthem: “Over? Was it over when the Germans… Its not over till we say it is. Im keeping my column in Tweet deck!” We continue to learn together in a variety of settings, work together (several of us went on to design and facilitate another connectivist MOOC (https://oclmooc.wordpress.com/about-oclmooc/), write about it individually (http://www.nmc.org/news/open-innovations-etmooc-connected-learning-and-moochorts-lifelong-learners) and as co-writers, and engage in teaching-training-learning-doing so that the community continues to grow by acquiring new members. Yes, there is a difference, and each of us, through our continuing collaborations, contributes to the growth of that difference. Thanks a million for helping call attention to it. P.S. to Ken Bauer: Wouldn’t at all discourage you from cloning the #etmooc community (what an intriguing and frightening thought: an informal #etmooc franchise! ), and would also remind you that there’s another option: join us via the #etmooc community on Google+, our tweet chats, and other ongoing activities. There’s plenty of room in the learning pool. Thanks for filling in such rich detail Paul; again this is the gold stuff that you won’t read about in the big media outlets. And it shows perhaps what I tried to call the spread over scale, or even smear and mutate, with oclmooc and its derivatives. You can puff up one giant Tyrannosaurus xMOOC and drumbeat about the numbers or watch all these little mammals run around beneath its feet. Thanks for the invite Paul, I will find some time to stop by. The cloning isn’t so much about a splitting but I think there is value in having a group of “new to sharing” folks to start off in the wading pool (thanks for the analogy) where they feel comfortable; that is something I’m working on building here with my colleagues in México. I don’t think anyone would take my point that way but sometimes I’m not good at stating my intent, I just jump in the deep end. Alan and Ken: The conversation continues; building upon my initial comments here, I documented additional reflections about what started with this “cMooc That Would Not Die” article and am beginning to suspect that this is also the cMOOC Conversation That Will Not (and Should Not) Die: https://buildingcreativebridges.wordpress.com/2015/05/29/alan-levine-etmooc-and-the-cmooc-that-would-not-die/. Thanks again for the inspiration and additional learning. 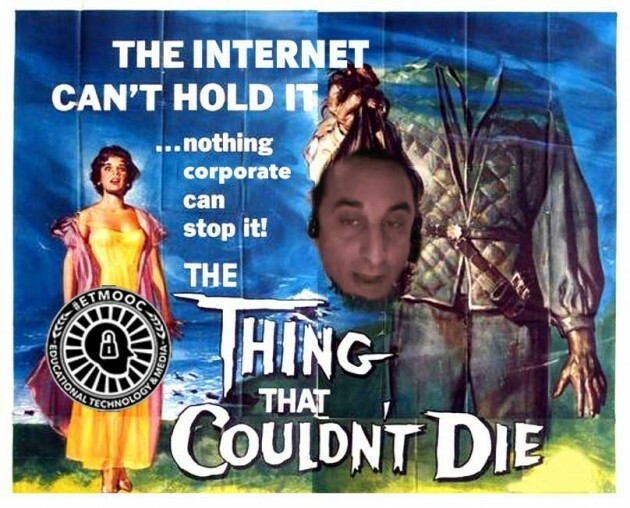 Great post Alan, I especially love the mooc that wouldn’t die poster! I often wonder about all of the rhizomes that grew out of etmooc – how many people are still sharing the message of open and connected sharing in big and small ways. I regularly connect and collaborate with other #etmooc alumni and read about other ways that alumni are spreading the message of open sharing. I found your article today because I regularly visit Paul Signorelli’s blog. I met Paul during the 2013 ETMOOC. One of the things I liked about the ETMOOC was the way they were using maps to show where participants were located. I started using the same mapping application to map participation in Tutor/Mentor Leadership Conferences I’ve held in Chicago since 1994. In addition, as I joined other MOOCs in 2013 and 2014, such as the Deeper Learning MOOC and the Making Learning Connected MOOC, I encouraged them to add a map to their own page. Both did. I’ve been following on-line communities, such as Webheads, since around 2002. I’m a fan of the type of MOOC experience you have described so well because of the potential for people to build relationships and dig deeper into complex ideas. I’ve created a sub section in my own web library pointing to MOOCs like the ETMOOC, and i use my blog and social media to encourage leaders in the non-school youth tutoring, mentoring and learning world to launch MOOCs at key times each year, such as August when programs are looking for volunteers, and December when they are looking for money. My hope is that participation maps can show growing numbers of people from every major city in the US and around the world, and that network analysis maps will show that donors, policy makers, youth, parents and other stakeholders are joining in. Thus, the idea that “it won’t die” is one that I’d replace with “watch it grow”. Thanks, Daniel! What you describe is absoluter testimonial for this organic style of learning. And yes, “Watch it Grow” is more powerful than some message of invincibility. Perhaps, it’s time for Alec to organize the sequel; ETMOOC 2! Webmaker Origin Stories; Do Things Not Happen For a Reason, Too?